Marketed as an inexpensive option for vaporizing newbies the LITL One vape is really the little vape that could. When this vaporizer crossed my desk I was interested in checking it out, but I didn’t really know much about it to begin with. I hadn’t heard of the brand before and purposefully didn’t go look it up until I’d had a chance to try the device out. My first impression, right out of the box was that the size and shape is perfect for busy vapers. I’ve tried a lot of vaporizers in my day and some are great, some are ok and some are ridiculously large, hulking contraptions that weigh a ton and break easily. This little guy is simple and clean and fits in my pocket. The glass mouthpiece is small so it doesn’t pose a breakage risk (super important for me, the most uncoordinated woman I know). While it would be clear to anyone looking what I was doing, the unit is discreet enough for me. You charge it up via a lightning cable and the battery is good for 20 minutes of consecutive use. I have used it a few times and have only had to recharge it once. The unit has one heat setting (215 ° C so no guesswork needed there), a single button to turn it off and on and a small choke on the bottom of the unit to control the airflow. Oh yeah, and it is compatible with dried flower. I liked the simple and small design. It’s easy to carry and store. I liked the ceramic chamber, it’s easy to clean and my flower was evenly heated up. After my session I noticed that the herb was brown and crispy all over and not just on the bottom where it would have met the heating element. I liked the 45 second heat up time. I’m impatient at best and want things to work right away. I liked the price (more on that later). I experimented with grinding my bud and just popping smaller pieces into the chamber and while grinding the bud first produced a more even heating experience, adding chunks into the chamber worked too. I like that I have the option to be lazier about this product if I want to be. I wish there was a poker thing included in the unit to help me poke and stir and dig the flower .out of the chamber. The instructions said that you have to click the button 5 times to make it work, my first few times I had to click it over and over to get it to turn on. Full disclosure; I was likely doing something wrong but I didn’t know what - I mean, how do I get “click the button” wrong? I love the singular button on the iPhone but maybe on a device like this I’d want an on/off switch? This is really more about me than it is the LITL so it barely counts as a dislike. Once I had played with it for a while and passed it around to friends to try, I looked it up online and was surprised at the price: $39.99 USD! Now I was really impressed! 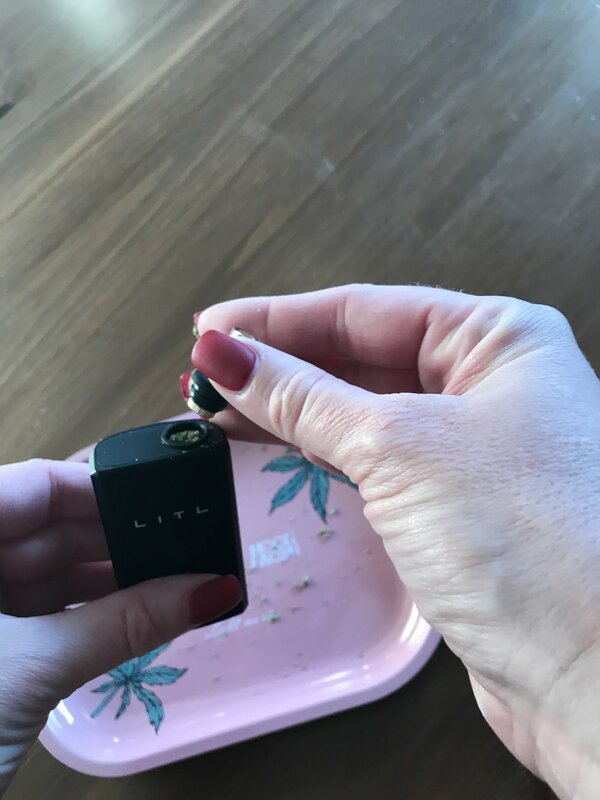 If I were looking to suggest an inexpensive vaporizer to a friend, especially one who is new to vaping I would recommend the LITL One. In the meantime, this little unit is going in my travel case, because it is the perfect size to take on an adventure.